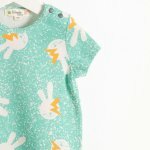 Light, airy and made of organic cotton, this shorty playsuit is guaranteed to keep tiny ones nice and comfortable in the summer heat. The "Bowie Bunny" vintage print is fresh for SS19. The press stud opening at the shoulder and crotch make dressing little ones nice and easy.